So, you’ve heard about CERRA’s nationally-recognized Teacher Cadet Program and want to begin offering the course in your school? 1.Contact Program Director, Michelle Dennis, to make your intentions known. Michelle can be contacted via email at Michelle.Dennis@cccs.edu or at 720-858-2291. 2. Ensure the course “makes” the course offerings list and begin recruiting students. Planning is an important next step. Discuss with your principal, guidance office or district curriculum coordinator your intent to offer this exciting and engaging program for the best and brightest students in your school. 3. Attend a three-day curriculum training seminar for Experiencing Education, the curriculum designed exclusively for the Teacher Cadet Program -a requirement of All Colorado Teacher Cadet Instructors. If your intent is to launch the program on a district level (with 8 or more schools/instructors), consider hosting a training in your area. 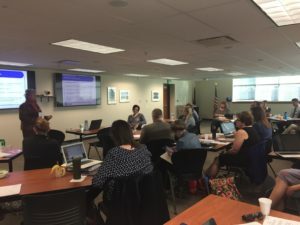 The cost is approximately $800.00 which includes one copy of the 11th Edition Experiencing Education curriculum, start-up resources, Colorado implementation resources, all other training materials, continental breakfast, and lunch each day. In addition, newly trained instructors will receive one year’s access to members-only resources on teachercadets.com site. Travel and hotel arrangments are the responsibility of the individual participant or school district. College professional development credit is available for participants. The PLAN, College In Colorado, Choices, Career Cruising, and other career interest surveys can be very helpful in identifying potential students. School staffs can identify students to address current Colorado teacher shortages, such as males, minorities, and teachers of special education, foreign languages, math, science or their particular subject area. Many students just need someone to encourage them to consider a career in education. Teacher Cadet is a great way to find out about the profession. Contact the Program Director with questions and for further assistance.